It may seem at first glance like a political riddle: How can President Obama’s job approval rating be above 50% when only about a third of the public is satisfied with the way things are going in the country? In a survey last month by Pew Research Center, 53% approved of Obama’s job performance while 42% disapproved. In three of four surveys since March, Obama’s job approval has been in positive territory – the first time this has occurred in more than three years. But just 31% said they were satisfied with the way things were going in the U.S., while more than twice as many (66%) were dissatisfied. Public satisfaction with the state of the nation has been very low for many years. In fact, it has not consistently reached 50% since late in Bill Clinton’s administration. National satisfaction and presidential job approval are both important measures of the public’s mood, but they measure different things. And when it comes to which presidential candidate people plan to vote for in November, presidential approval is a much stronger indicator than satisfaction with the state of the nation. This also was the case in 2008 and 2000, the last elections with no incumbent. Measures of national satisfaction have been in negative territory throughout Barack Obama’s presidency – as they were throughout most of the presidencies of his recent predecessors, George W. Bush and Bill Clinton. Over the course of Obama’s more than seven and a half years in office, overall public satisfaction with the state of the nation has never been higher than 34%. But Obama’s job performance ratings have consistently outpaced levels of national satisfaction, and by wide margins – a dynamic that is not unique to Obama. Over the past quarter-century, the public has been more likely to approve of the president’s job performance than to express satisfaction with the state of the nation. The persistence and size of the gap during Obama’s presidency is unique among recent administrations. In April 2009, a few months after Obama first took office, just 23% were satisfied with the state of the nation, while 63% approved of Obama. Though Obama’s job approval has dropped considerably since then, around half of the public has approved of his performance throughout most of his time in office. And the share expressing approval has never dipped below 40%. By comparison, through much of George W. Bush’s administration the two measures tracked more closely – and at the end of his administration, both satisfaction and approval had dropped below 30%. 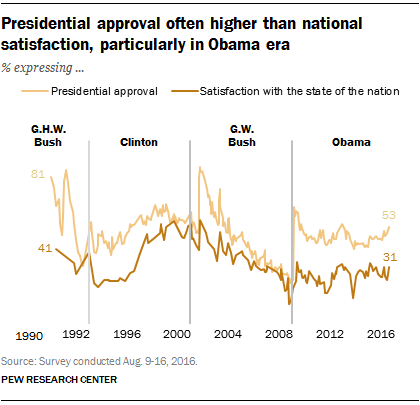 Conversely, while approval of Clinton’s performance far outpaced national satisfaction early in his presidency, the gap narrowed at the end of his term, as satisfaction with the state of the nation grew. Not surprisingly, partisans are highly polarized in their assessments of the president’s job performance (and this has grown in recent years). Today, just 13% of Republicans approve of Obama’s job performance, compared with 88% of Democrats who approve. Partisans also differ in their assessments of the state of the nation, tending to express higher levels of satisfaction when their own party holds the White House. But when the president is of their own party, their level of overall satisfaction with the nation typically lags behind their overwhelmingly positive evaluations of the president. Currently an overwhelming majority of Democrats (88%) approve of Obama’s job performance, but only a slim majority (52%) are satisfied with the state of the nation. 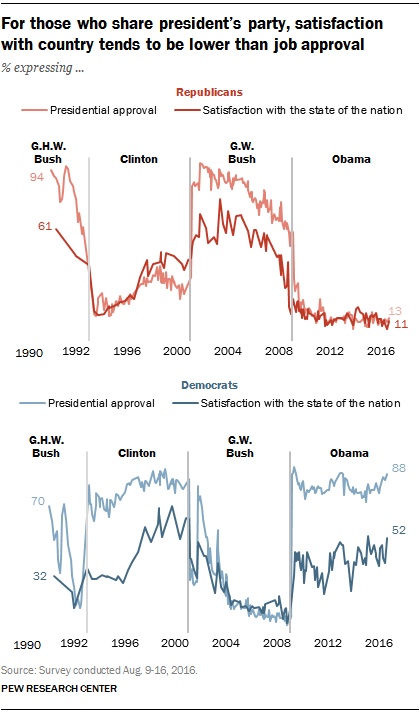 Throughout most of George W. Bush’s presidency, his approval ratings among Republicans outpaced their satisfaction with the state of the nation by 20 points or more. Conversely, for members of the party that does not control the White House, presidential approval and satisfaction tend to track more closely. Support for Hillary Clinton generally tracks with views of Obama’s job performance: Nearly eight-in-ten (77%) registered voters who approved of Obama in August plan to vote for her in November, while just 4% intend to vote for Trump (the remainder either support a third-party candidate or do not express a preference). Conversely, just 5% of those who disapprove of Obama plan to vote for Clinton. Views of the president were also strongly associated with voters’ preferences in the last two elections in which the incumbent president was not running. 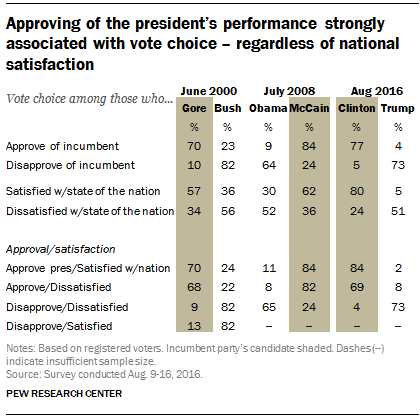 In August 2008, more than eight-in-ten (84%) of those who approved of George W. Bush’s job performance planned to vote for John McCain; just 24% of those who disapproved of Bush did so. The gap was similar in a survey conducted in June 2000: Al Gore garnered the support of 70% of those who approved of Bill Clinton’s performance, but only 10% of those who did not. The relationship between how voters feel about the state of the country and their vote intention is clear, but somewhat more modest. Overall, voters who are satisfied with the state of the nation are more likely to support the incumbent party’s president than those who are dissatisfied. Currently, 80% of voters who are satisfied with the state of the nation back Clinton, but about half (51%) of those who are dissatisfied also plan to vote for her. Similar, if somewhat narrower, gaps also were evident in 2000 and 2008. Combining the two measures illustrates how much more strongly presidential approval is related to vote choice. Currently, Clinton is overwhelmingly the choice among voters who both approve of Obama’s job performance and are satisfied with the country (27% of voters overall): 84% among this group intend to vote for Clinton and just 2% say they will vote for Trump. Although Clinton’s lead is slightly narrower among the 21% of voters who approve of Obama’s performance and are dissatisfied with the state of the nation, fully 69% still intend to vote for her and just 8% back Trump. By comparison, just 4% who are both dissatisfied with the state of the nation and disapprove of Obama’s job performance (45% of all voters) are planning to vote for Clinton, while 73% back Trump instead. And these three categories account for nearly all voters today: Almost no voters (just 1% of voters overall) both express satisfaction with the state of the nation and disapprove of Obama’s performance. These patterns are similar to previous elections, with the candidate of the incumbent party garnering support from two-thirds or more voters who approved of the incumbent president – regardless of whether those voters were satisfied or dissatisfied with the state of the nation. And in 2000, the only election in which a sizable, though still small (9%), share of voters both expressed satisfaction with the state of the nation and disapproved of the president’s job performance – views of the president were stronger predictors of vote intention than satisfaction with the nation: Just 13% of this group backed Gore, little different than the 9% of support among voters who expressed both dissatisfaction with the state of the nation and disapproval of Bill Clinton’s performance.